GJ.10, 5c. without accent over the U, dull rose, with ellipse 12x12 dotted cancel of Jujuy in blue, small thin on back, superb front! Lot 39 - Argentina escuditos - Guillermo Jalil - Philatino Auction # 1916 ARGENTINA: "Budget" auction with many good lots at VERY LOW STARTS! 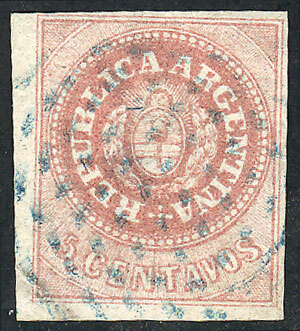 Lot 38 - Argentina escuditos - Guillermo Jalil - Philatino Auction # 1916 ARGENTINA: "Budget" auction with many good lots at VERY LOW STARTS! Lot 40 - Argentina escuditos - Guillermo Jalil - Philatino Auction # 1916 ARGENTINA: "Budget" auction with many good lots at VERY LOW STARTS!